While many Iranians are languishing under a mismanaged and floundering economy, the Iranian regime has attempted to shift the blame for its citizens’ distress to sanctions implemented by the international community to further demonize the West in the eyes of its population. The reality, however, is that economy has long been plagued by the regime’s endemic corruption, economic mismanagement, and reckless foreign policy. Iran ranks 131 out of 176 countries listed on Transparency International’s Corruption Perception Index for 2016. Corruption and mismanagement in Iran significantly worsened during the presidency of Mahmoud Ahmadinejad, despite the fact that he came to power on a populist, anti-corruption platform. In Ahmadinejad’s first year as president in 2005, for example, Transparency International ranked Iran at 88th among 159 countries in its annual corruption index. In 2012, the situation worsened considerably, with Transparency International ranking Iran as one of the most corrupt countries worldwide, with a ranking of 133 among 176 nations. Mahmoud Ahmadinejad and his administration presided over unprecedented corruption scandals. In 2009, a state audit found that the Iranian Oil Ministry failed to deposit $1.05 billion into state accounts related to surplus oil revenues. In 2011, the biggest financial scandal in Iran’s history was uncovered in which $2.6 billion was embezzled from the country’s leading banks. Iran also faced a healthcare crisis due to government mismanagement and corruption. In November 2012, Hosseinali Shahriari, the head of parliament’s health committee, said that “the government is playing with our people’s health and is not assigning the approved finances.” Iran’s then Minister of Health, Marzieh Vahid Dastjerdi, reported that of the $2.5 billion earmarked in Iran’s annual budget to import medicine and medical supplies, only $600 million had been delivered by Iran’s central bank this year. She further protested, “I have heard that luxury cars have been imported with subsidized dollars but I don't know what happened to the dollars that were supposed to be allocated for importing medicine.” This dissent was too much for the Iranian regime to tolerate, since it contradicted the regime narrative that U.S. and EU were to blame. As a result, Ahmadinejad fired Dastjerdi in late December 2012. She was the only female minister in the government’s cabinet. The Iranian government had the power to end this crisis, but instead made it worse to weaken the resolve of the international community to robustly implement sanctions. Through its oil exports, Iran had billions of dollars in local-currency accounts in Turkey and Asian countries, which could be used to buy medical supplies of local or Western-manufacture for the Iranian people. Instead, the regime exploited the welfare of its citizens in order to protect its illicit nuclear program. Ahmadinejad’s scandals continued to plague him even after he left office. His first vice president, Mohammad Reza Rahimi, was sentenced to five years in prison for “acquiring wealth through illicit methods” in 2015. Sentencing of his vice president for executive affairs, Mohammad Baghaei, soon followed in December 2017, when Baghaei announced he had been sentenced to 63 years in prison for financial malfeasance. That’s not to mention Ahmadinejad being convicted on seven counts, including misuse of state funds totaling two billion dollars, by the Supreme Audit Court. Hassan Rouhani took office in 2013 warning that corruption was “endangering” the Islamic Revolution and that money once “given under the table now is being given on the table.” He also sounded the alarm on the perils of monopolies in Iran—a subtle rebuke to the power and primacy of the IRGC in the economy. Analysts have given Rouhani mixed marks on his anti-corruption campaign. Scholars such asBijan Khajehpour, have highlighted the the establishment of “provincial offices to fight administrative corruption on bureaucratic levels” as well as the issuing of an anti-smuggling decree in 2014. 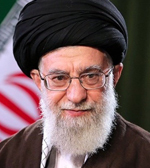 At the same time, according to the Financial Times, the Rouhani administration announced its intention to close credit institutions affiliated with the IRGC, increase oversight on the banking system, crack down on expropriation of land by elites and make powerful foundations which received tax exemptions in the past pay their fair share—particularly Astan-e Qods, which is headed by Ebrahim Raisi, Rouhani’s opponent in the 2017 presidential election. Yet Rouhani’s government has also stood accused of self-dealing. 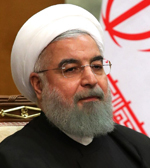 In 2016, the New York Times reported on bombshell allegations in Iranian media concerning inflated bonuses and salaries for executives of state-controlled companies on Rouhani’s watch. These figures were much higher than the legal limit of $2,353 per month for government employees. Other allegations included $50,000 bonuses for executives at the government-controlled Central Insurance Company and the head of the state-owned Tejarat Bank, named to his post under Rouhani, receiving $208,115 over 21 months and a zero-interest loan of $289,000. In addition Rouhani’s inner-circle also stood accused of corruption. Sadegh Larijani, the head of Iran’s judiciary, accused Rouhani publicly of receiving embezzled state funds from Babak Zanjani, the point main in assisting the Islamic Republic with evading the pre-nuclear deal sanctions. Rouhani’s first vice president Eshaq Jahangiri as well as his own brother Hossein Fereydoun were also targeted with nepotism and cronyism charges. As the protests of December 2017 and January 2018 over the state of the economy continue, Iran’s corruption ranking history during his tenure speaks volumes: according to World Bank data, the Islamic Republic’s ease of doing business ranking slid to 124 in 2017 from 120 in 2016 out of 190 economies from across the world. The IRGC, empowered under Ahmadinejad, is at the forefront of corruption in Iran today. Designed to safeguard the Islamic Revolution and maintain an ideologically austere ethos, the IRGC has become increasingly corrupt and materialistic. The IRGC now owns billions in assets and controls hundreds of shell corporations. The organization is commonly awarded no-bid contracts without independent oversight in Iran’s lucrative energy sector and across the economy. The IRGC claims that its profits then go into the national treasury, but there are no public records to verify this. Wealth also came historically from the IRGC’s immense smuggling operations. The IRGC leveraged its economic and political influence to corner Iran’s $12 billion smuggling industry by illegally importing vast quantities of goods through IRGC-controlled jetties and airport terminals that operate outside the jurisdiction of Iranian customs authorities. As a result of the IRGC’s financial penetration, it is estimated that IRGC control of the economy “range[s] from a third to nearly two-thirds of Iran's GDP – amounting to tens of billions of dollars.” The IRGC is estimated to own at least half of Iran’s government-owned companies and control 68 percent of Iran’s total exports. With this newfound wealth, the IRGC has been importing expensive luxury cars. President Rouhani’s proposed $337 billion budget for the year beginning in March 21, despite promising to clip the IRGC’s wings, relegates the regular army to second-tier status in the monetary hierarchy—reports indicate that the IRGC is slated to receive three times the amount of money as the army, at the same time that subsidies are being cut and fuel prices are expected to rise. In addition to SETAD’s lack of accountability, it has engaged in self-dealing. For example, in 2016, the National Iranian Oil Company (NIOC), which the U.S. Treasury Department has dubbed an agent or affiliate of the IRGC, signed its first oil output contract with Persia Oil & Gas Industry Development Company, an Iranian firm that is a subsidiary of SETAD. It’s within this context that Iran’s protests envelop the country—a country plagued by opacity, unaccountability, and corruption and mismanagement scandals across successive governments.